Abbot Point նավահանգստից ծովային նստվածքի դուրսբերման և 24 կմ հեռու` Բոուենի մերձակայքում (Քվինսլենդի հյուսիսային հատված) արտանետման նախագծի վավերացումը կհանգեցնի տարեկան 70 միլիոն տոննա լրացուցիչ ածուխի արդյունահանման, ինչն արժի 1.4-2.8 միլիարդ դոլար։ Կառավարման խորհրդի քարտուղար դոկտոր Ռասել Ռեյչելթը (Russell Reichelt) նախագծի հաստատումից հետո հայտարարել է.
Ծրագիրը հաստատվել է բնապահպանական 47 նոր պայմանների առկայությամբ, որոնք ներառում են հետևյալ պահանջները. ↑ UNEP World Conservation Monitoring Centre (1980). "Protected Areas and World Heritage – Great Barrier Reef World Heritage Area". Department of the Environment and Heritage. Archived from the original on 11 May 2008. Retrieved 14 March 2009. ↑ Fodor's. "Great Barrier Reef Travel Guide". Retrieved 8 August 2006. ↑ Department of the Environment and Heritage. "Review of the Great Barrier Reef Marine Park Act 1975". Archived from the original on 18 October 2006. Retrieved 2 November 2006. ↑ Sarah Belfield (8 February 2002). "Great Barrier Reef: no buried treasure". Geoscience Australia (Australian Government). Archived from the original on 1 October 2007. Retrieved 11 June 2007. ↑ Sharon Guynup (4 September 2000). "Australia's Great Barrier Reef". Science World. Archived from the original on 8 July 2012. Retrieved 11 June 2007. ↑ CNN (1997). "The Seven Natural Wonders of the World". Archived from the original on 21 July 2006. Retrieved 6 August 2006. ↑ National Trust Queensland. "Queensland Icons". Archived from the original on 19 September 2006. Retrieved 17 October 2006. ↑ Eilperin, Juliet (1 October 2012). "Great Barrier Reef has lost half its corals since 1985, new study says". The Washington Post. Retrieved 1 October 2012. ↑ Access Economics Pty Ltd (2005). "Measuring the economic and financial value of the Great Barrier Reef Marine Park" (PDF). Retrieved 2 March 2013. ↑ "Google Launches Underwater Street View". 16 November 2014. ↑ "Great Barrier Reef coral bleaching more widespread than first thought". The Sydney Morning Herald. 31 March 2016. Retrieved 2 April 2016. ↑ Jacobsen, Rowan (11 October 2016). "Obituary: Great Barrier Reef (25 Million BC-2016)". ↑ CNN, Sophie Lewis. "The Great Barrier Reef is not actually dead". ↑ "Great Barrier Reef General Reference Map" (PDF). Great Barrier Reef Marine Park Authority. September 2004. Retrieved 14 March 2009. ↑ Davies, P.J., Symonds, P.A., Feary, D.A., Pigram, C.J. (1987). "Horizontal plate motion: a key allocyclic factor in the evolution of the Great Barrier Reef". Science. 238 (4834): 1697–1700. Bibcode:1987Sci...238.1697D. doi:10.1126/science.238.4834.1697. ↑ MSN Encarta (2006). Great Barrier Reef. Archived from the original on 1 November 2009. Retrieved 11 December 2006. ↑ Tobin, Barry (2003) [revised from 1998 edition]. "How the Great Barrier Reef Was Formed". Australian Institute of Marine Science. Retrieved 22 November 2006. ↑ CRC Reef Research Centre Ltd. "What is the Great Barrier Reef?". Archived from the original on 22 August 2006. Retrieved 28 May 2006. ↑ Great Barrier Reef Marine Park Authority (2006). "A "big picture" view of the Great Barrier Reef" (PDF). Reef Facts for Tour Guides. Archived from the original (PDF) on 20 June 2007. Retrieved 18 June 2007. ↑ Harris, P. T., T.C.L. Bridge, R. Beaman, J. Webster, S. Nichol, and B. Brooke (2013). "Submerged banks in the Great Barrier Reef, Australia, greatly increase available coral reef habitat". ICES Journal of Marine Science. 70 (2): 284–293. doi:10.1093/icesjms/fss165. ↑ Hopley, D., S.G. Smithers, and K.E. Parnell (2007). The geomorphology of the Great Barrier Reef: development, diversity, and change. Cambridge: Cambridge University Press. ↑ Western Australia's Department of Environment and Conservation (2007). "The Devonian 'Great Barrier Reef'". Archived from the original on 11 September 2007. Retrieved 12 March 2007. ↑ Great Barrier Reef Marine Park Authority. "Representative Areas in the Marine Park". Archived from the original on 28 September 2007. Retrieved 23 March 2007. ↑ Great Barrier Marine Park Authority. "Protecting the Bioregions of the Great Barrier Reef" (PDF). Archived from the original (PDF) on 2 June 2011. ↑ Great Barrier Reef Marine Park Authority. "Bio-region Information Sheets". Archived from the original on 31 August 2007. Retrieved 23 March 2007. ↑ CSIRO (2006). "Snapshot of life deep in the Great Barrier Reef". Retrieved 13 March 2007. ↑ Great Barrier Reef Marine Park Authority (2000). "Fauna and Flora of the Great Barrier Reef World Heritage Area". Archived from the original on 14 October 2006. Retrieved 24 November 2006. ↑ CRC Reef Research Centre Ltd. "Reef facts: Plants and Animals on the Great Barrier Reef". Archived from the original on 21 August 2006. Retrieved 14 July 2006. ↑ Great Barrier Reef Marine Park Authority (2004). "Environmental Status: Marine Mammals". The State of the Great Barrier Reef Report – latest updates. Archived from the original on 2 October 2006. Retrieved 13 March 2007. ↑ Great Barrier Reef Marine Park Authority. "Fish Spawning Aggregation Sites on the Great Barrier Reef". Archived from the original on 16 December 2008. Retrieved 14 March 2009. ↑ "Appendix 2 – Listed Marine Species". Fauna and Flora of the Great Barrier Reef World Heritage Area. 2000. Retrieved 23 May 2007. ↑ Dobbs, Kirstin (2007). Marine turtle and dugong habitats in the Great Barrier Reef Marine Park used to implement biophysical operational principles for the Representative Areas Program (PDF). Great Barrier Marine Park Authority. Archived from the original (PDF) on 18 July 2011. ↑ Great Barrier Reef Marine Park Authority (2005). "Environmental Status: Seagrasses". The State of the Great Barrier Reef Report – latest updates. Archived from the original on 2 October 2006. Retrieved 23 May 2007. ↑ Great Barrier Reef Marine Park Authority (2005). "Environmental Status: Marine Reptiles". Archived from the original on 2 June 2011. ↑ "Environmental Status: Sharks and rays". The State of the Great Barrier Reef Report – latest updates. Archived from the original on 29 March 2007. Retrieved 23 May 2007. ↑ "Appendix 4- Other species of conservation concern". Fauna and Flora of the Great Barrier Reef World Heritage Area. 2000. Archived from the original on 31 August 2007. Retrieved 13 September 2007. ↑ "Appendix 5- Island Flora and Fauna". Fauna and Flora of the Great Barrier Reef World Heritage Area. 2000. Archived from the original on 31 August 2007. Retrieved 13 September 2007. ↑ Kent, David; Smithers, Scott G.; Parnell, Kevin E. (2007). The geomorphology of the Great Barrier Reef : development, diversity, and change. Cambridge : Cambridge University Press. pp. 450–451. ISBN 0-521-85302-8. ↑ Great Barrier Reef Marine Park Authority. "Environmental status: birds". The State of the Great Barrier Reef Report – latest updates. Archived from the original on 28 September 2007. Retrieved 23 May 2007. ↑ "Environmental status: birds Condition". The State of the Great Barrier Reef Report – latest updates. Archived from the original on 28 September 2007. Retrieved 23 May 2007. ↑ Great Barrier Reef Marine Park Authority (2006). "Information Fact Sheets No.20 Coral Spawning" (PDF). Archived from the original (PDF) on 14 June 2007. Retrieved 27 May 2007. ↑ Australian Institute of Marine Science (2002). "Soft coral atlas of the Great Barrier Reef". Archived from the original on 6 April 2007. Retrieved 27 May 2007. ↑ Harriott, V.J. (2002). "Marine tourism impacts and their management on the Great Barrier Reef" (PDF). CRC Reef Research Centre Technical Report No. 46. CRC Reef Research Centre. Archived from the original (PDF) on 18 March 2009. Retrieved 8 March 2009. ↑ "AIMS Longterm Monitoring – Coral Diseases on the Great Barrier Reef – Skeletal Eroding Band". www.aims.gov.au. Archived from the original on 13 July 2009. Retrieved 22 August 2009. ↑ Eilperin, Juliet (2 October 2012). "Great Barrier Reef has 'lost half its coral since 1985'". Washington Post. London: The Independent. Retrieved 3 October 2012. ↑ Rothwell, Don; Stephens, Tim (19 November 2004). "Global climate change, the Great Barrier Reef and our obligations". Melbourne: The National Forum. Archived from the original on 12 October 2007. Retrieved 26 September 2007. ↑ Great Barrier Reef Marine Park Authority. "Our changing climate". Archived from the original on 29 October 2007. Retrieved 26 September 2007. ↑ Great Barrier Reef Marine Park Authority. "Coral Bleaching and Mass Bleaching Events". Archived from the original on 20 April 2006. Retrieved 30 May 2006. ↑ "Online version". The Daily Telegraph. 30 January 2007. Archived from the original on 26 February 2009. ↑ Littman, Raechel; Willis, Bette L.; Bourne, David G. (2011). "Metagenomic analysis of the coral holobiont during a natural bleaching event on the Great Barrier Reef". Environmental Microbiology Reports. 3 (6): 651–660. doi:10.1111/j.1758-2229.2010.00234.x. ↑ Great Barrier Reef Marine Park Authority. "Climate change and the Great Barrier Reef". Archived from the original on 8 December 2006. Retrieved 16 March 2007. ↑ Schmidt, C.; Heinz, P.; Kucera, M.; Uthicke, Sven (2011). "Temperature-induced stress leads to bleaching in larger benthic foraminifera hosting endosymbiotic diatoms" (PDF). Limnology and Oceanography. 56 (5): 1587–1602. doi:10.4319/lo.2011.56.5.1587. Archived from the original (PDF) on 4 March 2016. ↑ "Coastal water quality" (PDF). The State of the Environment Report Queensland 2003. Environment Protection Agency Queensland. 2003. Archived from the original (PDF) on 14 June 2007. Retrieved 7 June 2007. ↑ "Human Impact on the Great Barrier Reef". University of Michigan. Retrieved 12 February 2014. ↑ Griffith, Hywel (2016-11-28). "Great Barrier Reef suffered worst bleaching on record in 2016, report finds". BBC News. Retrieved 2016-11-28. ↑ Great Barrier Reef Marine Park Authority. "Wetlands". Archived from the original on 2 October 2006. Retrieved 13 March 2007. ↑ Brodie, J. (2007). "Nutrient management zones in the Great Barrier Reef Catchment: A decision system for zone selection" (PDF). Australian Centre for Tropical Freshwater Research. Retrieved 14 March 2009. ↑ Australian Government Productivity Commission (2003). "Industries, Land Use and Water Quality in the Great Barrier Reef Catchment – Key Points". Archived from the original on 2008-08-16. Retrieved 14 March 2009. ↑ Great Barrier Reef Marine Park Authority (2006). "Principal water quality influences on Great Barrier Reef ecosystems". Archived from the original on 16 October 2006. Retrieved 22 October 2006. ↑ Milman, Oliver (12 February 2014). "Clive Palmer's nickel refinery pumped toxic waste into Great Barrier Reef park". The Guardian. Retrieved 12 February 2014. ↑ "CRC Reef Research Centre Technical Report No. 32 – Crown-of-thorns starfish(Acanthaster planci) in the central Great Barrier Reef region. Results of fine-scale surveys conducted in 1999–2000". Archived from the original on 29 August 2007. Retrieved 7 June 2007. ↑ RRC Reef Research Centre. "Crown-of-thorns starfish on the Great Barrier Reef" (PDF). Archived from the original (PDF) on 26 August 2006. Retrieved 28 August 2006. ↑ CSIRO Marine Research (1998). "Environmental Effects of Prawn Trawling". Archived from the original on 18 February 2006. Retrieved 28 May 2006. ↑ Great Barrier Reef Marine Park Authority. "Marine Park Zoning". Archived from the original on 19 July 2006. Retrieved 8 August 2006. ↑ Great Barrier Reef Marine Park Authority. "Great Barrier Reef Marine Park Authority :: Shipping". Archived from the original on 2 October 2006. Retrieved 13 March 2007. ↑ Environmental Protection Agency/Queensland Parks and Wildlife Services. "About the Reef". Archived from the original on 15 August 2007. Retrieved 23 March 2007. ↑ "Marine Safety Investigation Report – Preliminary – Independent investigation into the grounding of the Chinese registered bulk carrier Shen Neng 1 at Douglas Shoal, Queensland, on 3 April 2010". Australian Transport Safety Bureau. 15 April 2010. Retrieved 14 May 2010. ↑ "Coal being removed at sea from stricken Shen Neng 1 carrier". The Australian. News Ltd. 13 May 2010. Retrieved 13 May 2011. ↑ Great Barrier Reef Marine Park Authority (2006). "Fact Sheet No. 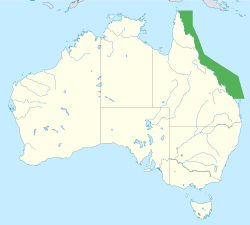 4 – Aboriginal and Torres Strait Islander People and the Great Barrier Reef. Region" (PDF). Archived from the original (PDF) on 14 June 2007. Retrieved 28 May 2006. ↑ Great Barrier Reef Marine Park Authority. "reefED – GBR Traditional Owners". Retrieved 14 March 2009. ↑ Great Barrier Reef Marine Park Authority. "Aboriginal & Torres Strait Islander Culture & Dugongs and Turtles". Archived from the original on 28 September 2007. Retrieved 23 May 2007. ↑ Bell, Peter. "A history of exploration and research on the Great Barrier Reef". Australian Institute of Marine Science. Archived from the original on 16 October 2009. Retrieved 11 January 2010. ↑ Queensland Museum. "HMS Pandora". Archived from the original on 29 August 2006. Retrieved 12 October 2006. ↑ "Raine Island Corporation". Archived from the original on 2 November 2007. Retrieved 20 November 2007. ↑ Commonwealth of Australia (1975). "Great Barrier Reef Marine Park Act 1975". Retrieved 30 August 2006. ↑ "Rewards Program". Onboard: The Tourism Operator's Handbook for the Great Barrier Reef. Great Barrier Reef Marine Park Authority. Archived from the original on 27 August 2008. Retrieved 14 March 2009. ↑ "FACT SHEET – MARINE BIOREGIONAL PLANNING – THE PROCESS" (PDF). environment.gov.au. Archived from the original (PDF) on 14 March 2011. ↑ Great Barrier Reef Marine Park Authority (2003). "Zoning Plan 2003" (PDF). Archived from the original (PDF) on 21 November 2008. Retrieved 14 March 2009. ↑ Fernandes et al. (2005) Establishing representative no-take areas in the Great Barrier Reef: large-scale implementation of theory on marine protected areas, Conservation Biology, 19(6), 1733–1744. ↑ World Wildlife Fund Australia. "Great Barrier Reef – WWF-Australia". Retrieved 10 November 2006. ↑ BBC News (15 June 2006). "Bush creates new marine sanctuary". Retrieved 28 December 2008. ↑ "Great Barrier Reef Outlook Report". Great Barrier Reef Marine Park Authority. 2007. Retrieved 31 August 2007. ↑ "Great Barrier Reef Outlook Report 2009 in Brief" (PDF). Great Barrier Reef Marine Park Authority. 2009. Archived from the original (PDF) on 29 September 2009. Retrieved 10 June 2010. ↑ Oliver Milman (10 December 2013). "Greg Hunt approves dredging off Queensland to create huge coalport". The Guardian. Retrieved 18 December 2013. ↑ Dermot O'Gorman (31 January 2014). "Dredge dumping: just because you can doesn't mean you should". ABC News. Retrieved 1 February 2014. ↑ "Marine Parks dredge dumping permit" (PDF). Great Barrier Reef Marine Park Authority. Retrieved 12 February 2014. ↑ "Dredge dumping banned on Great Barrier Reef". Australian Geographic. 13 November 2014. Retrieved 17 November 2014. ↑ Great Barrier Reef Marine Park Authority (2005). "Protecting Biodiversity Brochure 2005". Archived from the original on 17 October 2006. Retrieved 11 November 2006. ↑ Driml, Sally; Common, Mick (1996). "Ecological Economics Criteria for Sustainable Tourism: Application to the Great Barrier Reef and Wet Tropics World Heritage Areas, Australia" (PDF). Journal of Sustainable Tourism. 4 (1). Archived from the original (PDF) on 18 December 2008. Retrieved 31 October 2008. ↑ Great Barrier Reef Marine Park Authority (2003). "Summary report of the social and economic impacts of the rezoning of the Great Barrier Reef Marine Park" (PDF). Archived from the original (PDF) on 20 September 2008. Retrieved 14 March 2009. ↑ Ove Hoegh-Guldberg (14 March 2014). "Is Australia shooting itself in the foot with reef port expansions?". The Conversation. Retrieved 14 March 2014. ↑ Great Barrier Reef Marine Park Authority. "Number of Tourists Visiting The Great Barrier Reef Marine Park". Retrieved 19 October 2011. ↑ Saltzer, Rebecca (February 2002). "Understanding Great Barrier Reef visitors preliminary results" (PDF). CRC Reef Project B2.1.1: Understanding Tourist Use of the GBRWHA. Cooperative Research Centre for the Great Barrier Reef World Heritage Area. Archived from the original (PDF) on 25 July 2005. Retrieved 14 March 2009. ↑ Hildebrandt, Amy (January 2003). "Understanding Tourist Use of the Great Barrier Reef: The Whitsundays Visitor" (PDF). CRC Reef Project B2.1.1: Understanding Tourist Use of the GBRWHA. Cooperative Research Centre for the Great Barrier Reef World Heritage Area. Archived from the original (PDF) on 25 July 2005. Retrieved 14 March 2009. ↑ Great Barrier Reef Marine Park Authority (2005). "How is the Money Used?". Onboard – The Tourism Operator's Handbook for the Great Barrier Reef. Archived from the original on 20 September 2006. Retrieved 11 November 2006. ↑ Lamb, Joleah; Bette Willis (August 2011). "Using coral disease prevalence to assess the effects of concentrating tourism activities on offshore reefs in a tropical marine park". Conservation Biology. 25 (5): 1044–1052. doi:10.1111/j.1523-1739.2011.01724.x. PMID 21848962. ↑ Kight, Caitlin. "Are Coral Reefs Literally Sick of Ecotourists?". Retrieved 15 March 2012. ↑ "Turtle and dugong footage causes controversy". Bell, Peter (1998). AIMS։ The First Twenty-five Years. Townsville։ Australian Institute of Marine Science. ISBN 978-0-642-32212-8. Bowen, James; Bowen, Margarita (2002). The Great Barrier Reef ։ history, science, heritage. Cambridge ։ Cambridge University Press. ISBN 0-521-82430-3. Done, T.J. (1982). "Patterns in the distribution of coral communities across the central Great Barrier Reef". Coral Reefs. 1 (2)։ 95–107. Bibcode։1982CorRe...1...95D. doi։10.1007/BF00301691. "Research Publications". Great Barrier Reef Marine Park Authority. Archived from the original on 18 July 2011. Hutchings, Pat; Kingsford, Mike; Hoegh-Guldberg, Ove (2008). The Great Barrier Reef։ Biology, Environment and Management. CSIRO Publishing. ISBN 978-0-643-09557-1. Lucas, P.H.C. ; et al. (1997). The outstanding universal value of the Great Barrier Reef World Heritage Area. Great Barrier Reef Marine Park Authority. ISBN 0-642-23028-5. Mather, P.; Bennett, I., eds. (1993). A Coral Reef Handbook։ A Guide to the Geology, Flora and Fauna of the Great Barrier Reef (3rd ed.). Chipping North։ Surrey Beatty & Sons Pty Ltd. ISBN 0-949324-47-7.